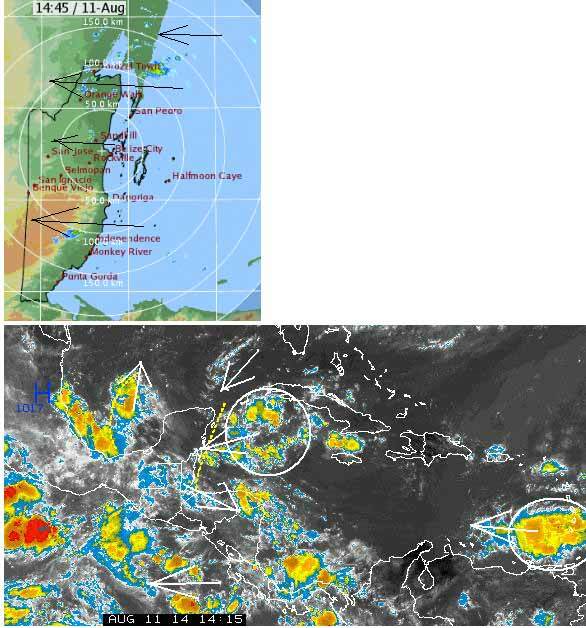 Belize NMS: Somewhat moist and unstable conditions prevail. 24-hour forecast: Cloudy skies with sunny periods today and cloudy skies tonight.A few showers and isolated thunderstorms mostly along coastal areas today then over most areas tonight. Today: Winds: E/NE 5-15 kts. ; seas: Choppy. ; waves: 2-4 ft.; a few showers or isolated thunderstorms(morning mainly). Tomorrow: Winds: East 5-15 kts. ; seas: Choppy. ; waves: 2-4 ft.; a few showers or isolated thunderstorms. Marine Outlook: Tuesday night:- Winds: E/SE 5-15 kts. ; seas: Choppy. ; waves: 2-4 ft.; isolated showers and thunderstorms. General Outlook: Through to Wednesday morning: Cloudy skies with a few showers and isolated thunderstorms to affect most areas as a tropical wave crosses. On Ambergris Caye this morning we have an expected high of 89 with sprinkles and sunshine. Great photo! You can just see the fall weather coming. There are all sorts of wet air movements around Belize at present, one coming in from Cuba. ...Presently causing significant rain showers over North Belize and Mexico, and may well continue to over the next 24 hours.. .. . There are also less frequent scattered showers over central southern Belize and some possible over any part of Belize today. . . .But mainly it will be a cloudy day with some sun. There are two other large weather areas, one crossing the West Indies now, bringing rain there. . .. The other just coming off Africa and that looks as if it is already rotating.. . . . In fact they have already spotted it and calling it 94L. .. Presently, they think it will track north of the Caribbean, but that could change later. Relatively moist and unstable conditions are starting to set it and will influence our weather in the days ahead. 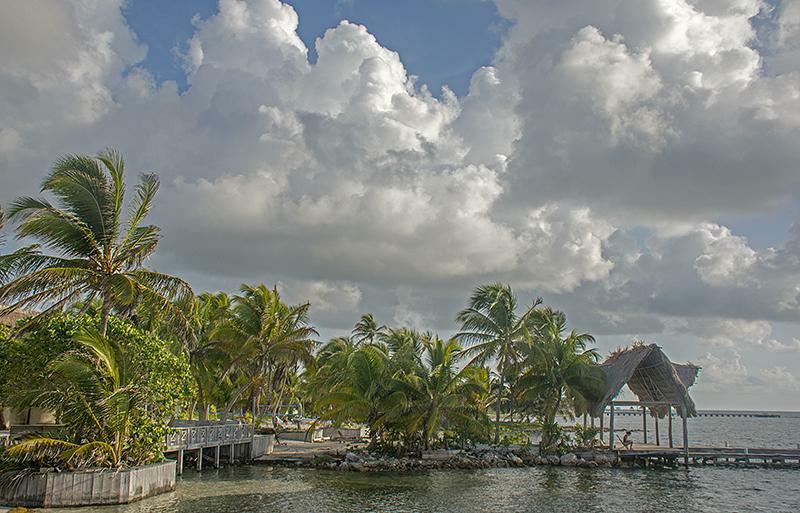 The general forecast for Belize and her coastal waters is for cloudy skies with sunny periods this afternoon. Tonight and tomorrow morning skies will be cloudy. Winds over the open sea and along the coast will be easterly to northeasterly at five to fifteen knots. The sea state will be choppy. Temperatures will peak at 89 degrees Fahrenheit this afternoon along the coast; 93 degrees Fahrenheit inland and 81 degrees Fahrenheit up in he hills. Low temperatures tonight will be around 78 degrees Fahrenheit along the coast; 73 degrees Fahrenheit inland and a comfortable 70 degrees Fahrenheit up at the exposed areas of the Mountain Pine Ridge and along the Maya Mountains in the south. The tides: there will be a low tide at 4:45 PM. A high is at 10:57 PM and another low tide is at 4:39 am on Tuesday. The sun set is at 6:21 PM. Sunrise on Tuesday is a 5:35 am. The extended forecast valid through to Wednesday afternoon is for a few showers and isolated thunderstorms to affect mainly the north on Tuesday afternoon, then the south on Tuesday night, decreasing on Wednesday.